Food Costs > How Much Does a Star Fruit Cost? How Much Does a Star Fruit Cost? Very unique, the star fruit, a tropical fruit with a five-pointed star shape and shades of yellow and green or brown accents depending on the ripeness, is not only popular in the United States, but it is also very popular in Asian countries such as the Philippines, Indonesia, Malaysia, India, Bangladesh and Sri Lanka. Also referred to as the carambola, this fruit can be eaten as is, but it can be cooked in many recipes as well. “Starfruit. Star Fruit. Carambola.” (CC BY 2.0) by DeusXFlorida (9,505,955 views) – thanks guys! How much does star fruit cost per pound? On average, a star fruit is going to cost anywhere from $2 to as much as $6 per pound. The costs will depend on the type of year and where you purchase it. Amazon.com, for example, have a few sellers who offer star fruit when it’s in season. The prices, according to the listings, ranges anywhere from $6 to $9 per pound. The taste of a star fruit closely resembles the plum, lemon and pineapple and is known for its “tangy” flavor. 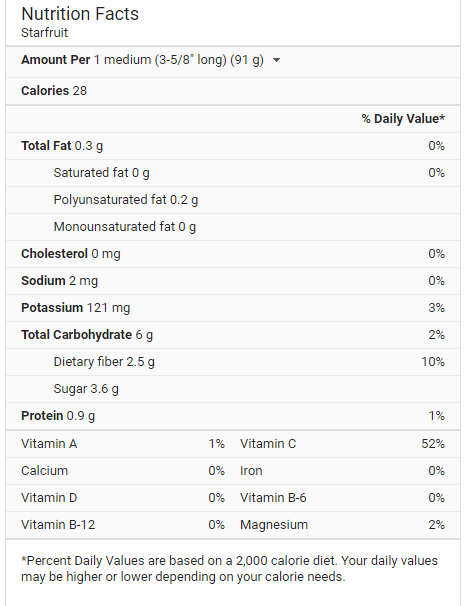 It’s full of dietary fiber, vitamins A, B, C and antioxidants. While most of your big box grocery stores won’t carry this fruit, you will either have to purchase it online or at a local Asian imported market. Whole Foods, if the fruit is in season, has been said to carry this fruit as well. 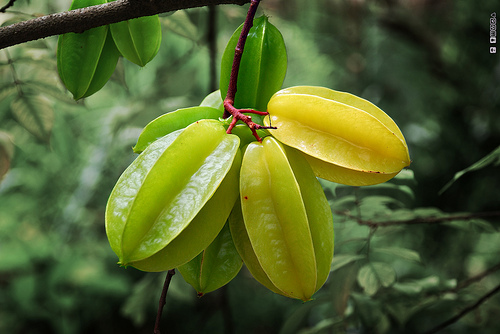 In the United States, most star fruits will import from either the United States or Taiwan. Since it can be hard to find at a local retailer, you may have to resort to purchasing online. If you don’t meet the company’s recommended minimum spending requirements, then you may have to spend a small shipping fee. The star fruit acquired its name because of its five-pointed star shape. When the fruit is cut through the middle, it will have a waxy, yellow color. The star fruit will be in season during the early summer. The whole fruit is edible except for the chewy seed part in the middle. If purchasing online, try to buy a fruit that originated from a tropical country for a better taste. A star fruit has many benefits. For example, they can lower your cholesterol levels as well as cure headaches, ringworm and even chickenpox. It is also a cure for hangovers and sore eyes. Star fruit is also recommended for those people who are dieting because of its low-calorie content and high fiber. Keep it refrigerated for up to a week inside an airtight container. It can be stored at room temperature for up to five days. Slices can also be frozen to preserve its freshness. Using a sharp butcher knife, slide the blade along the green edges of the star fruit, being careful to only remove the non-orange edge. Once the edges are removed, slice off the two ends and only remove about a half of an inch, but not too much. At this point, your fruit should have no more green or brown areas left. You’ll notice that your slices have seeds in them, mostly in the middle pieces. These should be removed with the tip of the knife.